I'm not sure that there is a label in the world whose email updates I rely on more than Slumberland. Even though I don't like everything they release (some bands tends to be a bit sleepy for me), they do have several bands that I do enjoy so I always read about their new releases to see if the next one is something more up my alley. When the description of this Bent Shapes album ended up in my mailbox, it seemed like my cup of tea. 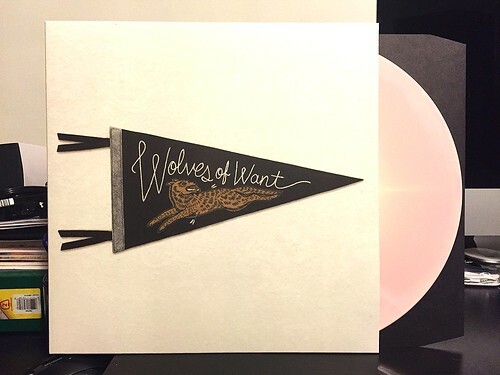 Wolves of Want is just a wonderful blend of clean, peppy guitar tones, upbeat rhythms and such great vocal harmonies. Bent Shapes hit it out of the park with this one. These hooks just get stuck in my head for days at a time. There's enough energy and enthusiasm to keep me engaged, but they never sacrifice the melody just to play a little fast or louder. The melody is the key and the songs are built spectacularly around that. The only time things get a bit wonky for me is during "USA v. POR." It's slow and there's this odd spoken word thing going on that sticks out a bit from the rest of the album. But truthfully, the song is short, not inherently bad or anything and provides a nice little break from the rest of the songs. I don't think it's as clever as maybe some other folks do, but it doesn't really hurt the album. Other than that it's just hit after hit on Wolves oif Want. Bent Shapes have put out easily one of the best records of the year so far. I'm very thankful Slumberland keeps sending out those email updates.